The British royal family has favored my relatives for generations. I am an excellent gundog, if I do say so myself. You can probably see from my picture that I have a little Basset in my heritage. I am the heaviest of all the Spaniel breeds, and I am the first to admit that I am a bit slower out there in the field than some of the lighter weight hunting dogs. Nevertheless, I am a super gundog and I am extremely talented at flushing out game. I am also a good retriever. I do need to be brushed regularly and I sometimes need help getting the mud clumps from between my toes. I have a good personality and I can be a good pet, but I am happier being a hunting companion. When fully grown, I am between 17 and 20 inches tall (43.2 to 50.8 centimeters) and I weigh between 55 and 84 pounds (24.8 to 37.8 kilograms). We have no Clumber Spaniel Breeders listed at this time. 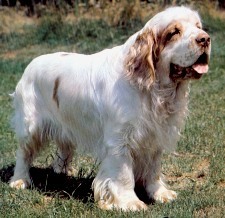 Click here to place your Clumber Spaniel Ad!